Steven is excited about the opportunity that Survive-it presents. Business will carry on as usual and we are looking for opportunities to grow and develop the business. Steven has over 20 years experience managing large format supermarkets, managing large teams of people and involved in the health & safety and food safety areas. Steven will attend some courses and training in the areas of civil defence preparedness, emergency management and first aid. Steven has two children and enjoys any spare time playing golf or biking. 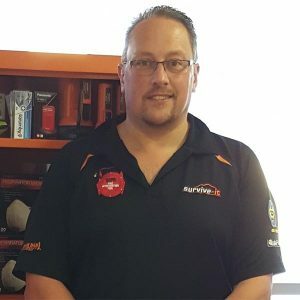 Joe has joined the sales team at Survive-it. He has come from the bakery and IT sector, where building client relationships was key. Joe is looking forward to building the same strong relationships for Survive-it, helping to better prepare workplaces with their civil defence emergency preparedness.